Are You Supported and Encouraged by Your Relationships? The people we spend most time with are going to influence deeply our self-belief. If you’re spending time with positive people this will result in a good support. 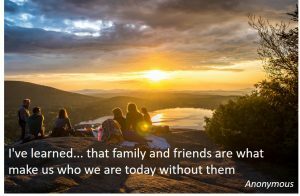 You friends and family are your most important source for words of upliftment and encouragement. But, at the same time, if they are unkind or negative, their attitude will push you down. There is a simple test to become aware of the effects on yourself of the people around you. Just pick of these people (family member, friend, colleague …) and ask yourself how you’d feel if you didn’t talk with this person for a week. Would you feel relieved or sad? Are you missing Uncle Bob’s rants about his job? Or your sister’s supporting call? A variation of this concept is very important in overcoming self-doubt and we are going to deal with it in my next post. You don’t have to cut out negative people from your life. Simply learn to limit their power on you: limit your time with them (…and their time with you…) and take control of your conversations with them. If what you are talking about isn’t helping your self-belief, change kindly the topic. A very effective way to manage the conversation is to ask questions (remember? We talked about questions as a way to refocus your thoughts – this is also a very good way to refocus other’s people thoughts…). The simple act of asking question will make you in charge. When you ask, you are going also to decide what to ask. And this will change the direction of your discussion. Ask something about good things and good events and what’s good, and you’ll neutralize the negative effects on yourself. You can get further, take the initiative and be the one who touches other people’s lives. What about being the one who inspires and uplifts someone today? The one that gives others words of encouragement for life? Could you try to be other people’s magic? Try this one. You’ll be surprised. Are You Going for New Experiences? It may be sound strange, but a too comfortable environment will draw down your self-belief. When you are too comfortable, you’ll be doing often the same things, every day. This will develop into habits, then routine. After a while, this will weaken your “muscles of change” and you’ll start see new things first as uncomfortable (that annoying resistance you feel when you have to do something not familiar), then as difficult. You don’t go beyond what’s safe and you don’t challenge yourself to experience new things. After another while, you to stop growing as a person. 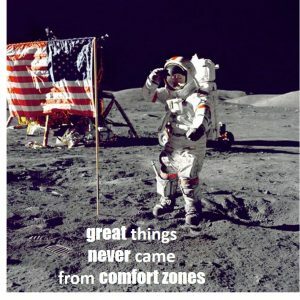 Frankly, great things never came from comfort zones. So, how to expand your comfort zone? The solution for this is to revert the process, go beyond your normal and look for new experiences, developing a new comfort for change. When you go outside, you open yourself up. You discover new ways to do things and find new solutions. You learn more about yourself and the world around you. You start thinking again that you could live life big. You’ll find new experiences by looking just outside of your comfort zone. Try a different type of cuisine. Drive a different route to work. Volunteer at an organization that you wouldn’t typically support. Take a weekend road trip and see where you end up. Be more adventurous and you’ll be grateful to yourself for this. You’ll find more suggestions in the workbook and in my 30-days self-confidence challenge. 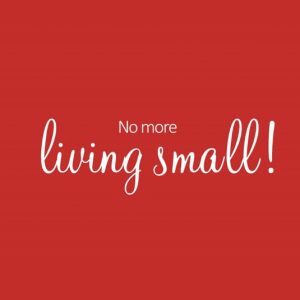 Live Life Big: What To Do When You Feel Stuck? If you are living small, at the end you will feel small. This means you feel under your potential, that out there somewhere there is so much more. Of course this doesn’t mean that you have to leave everything and go for an epic adventure. But for many people this will lead gradually to frustration and you start believing that you can’t do better. If you can’t do better, of course you’ll stop trying and at the end you’ll feel into a rut. This can be a little hard, but if this is happening to you, you can now understand that you are the one who is creating a self-fulfilling lack of self-belief without realizing it. Look at your life right now. What limitations are you accepting? Why aren’t you challenging them (surprise, this will uncover more limitations…)? What areas of your life have you accepted as “good enough”? When did it happen? You owe yourself living an extraordinary life. Maybe it’s not time to change your life, but you can take a breath, engage in a new big goal and see how it goes. Your environment shapes your self-confidence, but this doesn’t mean you can’t do nothing about it. 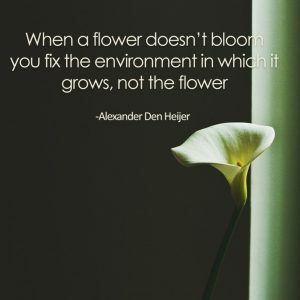 You are part of your environment, so you can interact with it and influence and modify it. So, look around at your life and go for some changes. Strengthen your relationship with the people who support you, try new things and engage in experiences that build up your self-belief and make you happy. 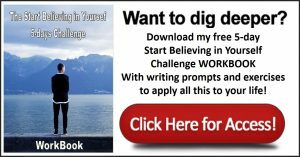 Discover how your environment is impacting you with a my free bonus 5-day self-belief challenge workbook. You are going to find reflection and exercises to apply all this to your life, start believing in yourself and start changing your environment. 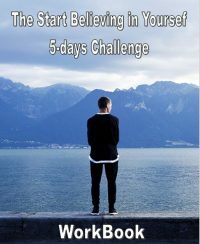 If you prefer a deeper journey to the discovery of your self-confidence, subscriber to my 30 days self-confidence challenge with the form below. Engage in the 30 Days Courage and Self-Confidence Challenge! 1 Are You Supported and Encouraged by Your Relationships? 3 Are You Going for New Experiences? 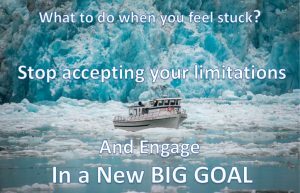 4 Live Life Big: What To Do When You Feel Stuck? 6 Engage in the 30 Days Courage and Self-Confidence Challenge!